Thankfully, we can exercise some control over our workspaces and with a few small changes, significantly improve our productivity, energy-levels, and happiness. 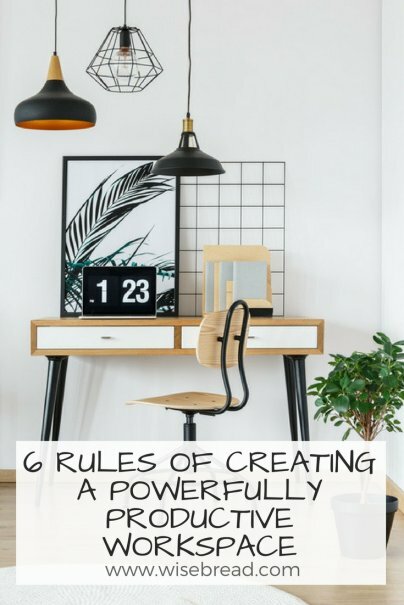 Here are six tips for creating a powerfully productive workspace. If you're setting up a home office or have some control over the arrangement of your office at work, design for how you'll actually use the space. Do you need a large desk or would you prefer room to move, organize multiple projects, or read comfortably? Is your office a hub for other workers, requiring more open space and a few extra seats? Do you travel extensively for work and need a place to stow luggage before and after flights? Designing for real-world use instead of purely stylistic concerns will help you build a space that supports, rather than fights, your work. Unfortunately for most workers, fluorescent lighting and office environments go hand-in-hand. But a growing body of research suggests that fluorescent's single spectrum of lighting may actually be doing us harm — contributing to inactivity, exhaustion, or anxiety. Studies show that fluorescent lighting in schools may be contributing to children's hyperactivity and abbreviated attention spans. To improve your productivity, bring as much natural light as possible into your workspace. Gravitate toward lighter colors, reflective surfaces, sheer window coverings, and other design elements that maximize natural light and reduce the need for glaring artificial light. It makes sense. We're natural creatures, and we respond well to the natural environment. While working indoors all day may be a necessary evil in our modern world, bringing a bit of nature in can help reduce stress and keep us engaged. Besides their aesthetic appeal, adding plant life to your workspace is an inexpensive way to improve air quality and interior humidity levels. Of course, the ultimate way to let nature and natural light into your office is to take advantage of a wonderful view. Though we may be sequestered away in our offices, taking a moment to enjoy a view of nature or society can have a restorative effect. If you're stuck in a windowless or garden-level office, create a faux view by hanging photos of inspiring outdoor scenes. Those sleek and minimalist offices look great in glossy magazine spreads, but adding a few personal touches to your space can help boost productivity. It's all about comfort. Think about it: If you have to spend 8-10 hours in a space, then photos, artwork, plants, and other items can help you feel more relaxed and, in a tangible way, connect your work with other parts of your life. A 2012 study conducted by the Carlson School of Management at the University of Minnesota found that people who work in messy or cluttered environments tend to be more creative and innovative, while those in more orderly spaces are prone to make healthier choices and be more generous. The bottom line? Clutterbugs and strict minimalists each have their upside. Stop worrying about how you think your space should look and embrace the strengths in your personality that are reflected in it. So, the next time you're clicking away at your keyboard and notice your fingers beginning to feel like sticks of lead, consider how your office may be working against your personal productivity. Would a smarter layout, better lighting, or personal touches help? With a few tricks and tweaks, you can change your space and reinvigorate your workday. At the very least, ditch those industrial fluorescents and let a little sunshine in. How do you maximize productivity in your workspace? What single idea or strategy has helped the most?